(C ) And with regard to compromise, a fundamental guideline there is that anything that strays away from the form of the game that people already know is something that inherently makes everyone have to form a whole new opinion about that new form of the game. HMC makes each game that much more interesting and requires the home manager to do his research. If the home team ends up losing a bunch of games, then it would be a clear indication the manager must go. This tactical addition plus a time-reducing mechanism (and perhaps dropping from 162 games to a reduced amount) could likely drive up viewership. The choice is binary - DH or No DH. Anything else is fluff that won't satisfy anyone. I reject this premise. Inferiority/superiority of pro championships is an academic debate occurring in a witheringly small space. No one is ignoring the World Series because of the DH issue. (Why they ARE ignoring the WS is another lengthy discussion.) The idea that a championship can decide best team AND best approach is a completely legitimate and worthy goal. The AL has won 25 WS compared to 20 for the NL since the DH was introduced. That's not a huge imbalance; certainly not enough to say the DH is entirely, or even mostly the cause. I'm only a single data point but I'm perfectly comfortable with the status quo. I think a debate like AL vs NL is one that could keep baseball more interesting, assuming they can fix some of those things that are currently making baseball less interesting. One aside: There is some "inside baseball" (pun intended!) stuff going on in the OP, that implies earlier discussion on this topic. Posted elsewhere and copied/pasted here? Was a little confusing when I originally read it. On any given day, wouldn't a manager choose to have an extra hitter? Or at the least, wouldn't he prefer to rest his pitcher even if the extra bat in the lineup wasn't particularly dynamic? This is a de facto DH implementation. Managers don't want to have to make that decision every day and be second-guessed for it. Put yourself in a manager's shoes. Every time you choose to use the DH and lose, thousands of dudes (maybe including the owner or GM who is looking for an excuse to fire you anyway) will hop on their favorite internet sites to say that you, the manager, lost the game because you shouldn't have let the other team's DH hit. 1a. Whether a PROCESS is a scientifically defensible one is NOT posited on how many times you get this result or that result. In fact, for all you know, if the process itself is skewed, the result maybe shouldn't have been about 50/50 in the first place... if it's skewed, for all you know, it's just as plausible that it should have been 100% of the time that one league's champ or the other would have won. If I test two cars for which one is faster, but one conforms to a NASCAR rule that the other does not, then don't be deceived... you're NOT testing for which car is faster... but which PROCESS is more likely to produce a car that is faster. 1b. It is a valid point to say as you do, in effect, "No one seems to care." 1c. It is also a valid point to say as I did, maybe they don't seem to care, but there's still integrity in the conscious attempt to make the process the SAME AS, and NOT inferior to how other pro sports leagues decide their champion. There's nothing wrong... and to the contrary, everything right... with deciding your champion through a process that OBJECTIVELY gives no favor to either side, SINCE they both observe the EXACT SAME rules governing the way they play the game, and which in turn helps dictate player conditioning and development. 2. "But wouldn't all managers just always use the DH anyway???" Longer answer is, that's occasionally been the first reaction some people have, but then they think about it, and they remember that managers look for every possible even slight advantage to win, game to game... and of course, it would be foolish to choose to use the DH if the other team's likely DH is better than yours, or if your pitcher that night is a decidedly better batter than the other team's. So, day to day, that's something a manager has to weigh based on the stats and gut feelings he uses for all the other decisions he makes in the pursuit of winning games. So, everyone gets their 81 games of deciding, and the other 81 games they comply with the opposition manager's decision. And every single one of us fans, then, gets to see the form of the game we prefer with some regularity... in my case, MUCH prefer... as opposed to the prospect that our preferred form of the game slinks away into the archives of baseball history. 3. Um. So you're saying that as long as we don't let managers decide, they can relax knowing that they won't be second guessed. I know. Hearing someone else repeat that back to you makes it sound a little more ridiculous than when you first wrote it. It happens to the best of us, me included, believe me. Managers accept that they're going to be second-guessed, if not for this, then for that, or for the other. Like anything else, the best managers embrace the second-guessing because they're good enough that they make more good calls than not... and the converse is also true. (02-11-2019 07:34 AM)BePcr07 Wrote: HMC makes each game that much more interesting and requires the home manager to do his research. If the home team ends up losing a bunch of games, then it would be a clear indication the manager must go. This tactical addition plus a time-reducing mechanism (and perhaps dropping from 162 games to a reduced amount) could likely drive up viewership. I obviously agree... it would be that much more interesting. That's the icing on the cake. I can only assume they've performed some market studies that suggest pace of play is a huge issue. How many years now have offensive coordinators and quarterbacks, and defensive coordinators and middle linebackers (usually) been hooked up so that the bench can call plays? How many seconds would be shaved off of every pause between pitches if, instead of the catcher putting down a sign and the pitcher shaking it off, and then the catcher putting down another sign and the pitcher shaking it off, and then the catcher standing up and signaling the pitcher that he's going with a whole other kind of signage pattern because he's suspicious that the runner at 2B is stealing signs, and then bending back down and putting down another sign, and then the pitcher shaking it off, and then the catcher asking the ump for time... etc... etc... or even just the minimum, that the catcher puts down a sign and the pitcher nods yes... how much more time efficient would it be if there was a voice speaking into the earpiece of both the catcher and the pitcher. That's a statement more than it is a question. If we figure a round number of 150 pitches thrown by both teams' pitching staffs each game... so 300 total... for every single second average shaved off of that part of the game... you've excised 5 minutes off the game.... shave an average of 5 seconds off that, you've lost 25 minutes. (02-11-2019 12:24 PM)dbackjon Wrote: The choice is binary - DH or No DH. Anything else is fluff that won't satisfy anyone. There are a whole lot of compromise rules that individuals have proposed, including myself... but because every time someone proposes one, everyone else is analyzing it to distinguish how much it leans more, or leans less, toward the pro-DH side than the anti-DH side, and based on that analysis, they decide if they're okay with it or not... so, just a proxy for, still, their pro-DH position or anti-DH position. As I said above, if it were up to me, the Duck Hunter DH would be the law of the land. There's more to it than this, but essentially the idea is, pitchers bat unless there is at least one duck on the pond (RISP), and in that case, the manager can send up the DH. But the primary protest is easy to imagine... "Pitchers would still end up batting a whole lot more than what I'm okay with." HMC, though, takes all the protest away, because it is binary in its essence, but takes the authority out of MLB HQ's hands, and puts it in individual manager's hands on a game-to-game basis. No one's form of the game is forever banished, everyone's form of the game is respected... and/but respected not on the basis of some anecdotal person's preferred form of the game, but SPECIFICALLY on the basis of ACTUAL strategy. It doesn't make sense because I say so. It just makes sense. It made sense from the beginning when they decided to use it in spring training, and all the more so now as we appear to be just a few years away from some decision getting made. It should be HMC. In fact, NOTHING else will be more satisfactory because if you go with ANYTHING else, ONE FORM OR THE OTHER of the game will be abolished forever, and people don't take kindly to that kind of authoritarian decision-making by MLB Aristocracy. Of course. This is why I didn't say there is proof one way or the other. I think we can (and sometimes do) make defensible arguments in both directions based on the data in hand. To me, that is a feature, not a bug. Quote: 1b. It is a valid point to say as you do, in effect, "No one seems to care." But "no one cares" was not the entire point. It's simply ONE of the reasons "integrity" may not be that important. Baseball is entertainment first and foremost and as such MLB needs to pay attention to whether they are actually entertaining. The debate over the DH is one we can have on paper but we can also watch it play out. Using WS results to evaluate the superiority of a league, as well as the team, is part of the entertainment. The WS is not inferior to other championships simply because MLB has two different approaches to playing the game. Quote: ...managers look for every possible even slight advantage to win, game to game... and of course, it would be foolish to choose to use the DH if the other team's likely DH is better than yours, or if your pitcher that night is a decidedly better batter than the other team's. I don't think it plays out like this. In fact, I think it plays out opposite Wedge's concern. Every time a manager "gut feels" a decision to have his pitcher hit, and loses, he'll be subject to second guessing by his GM and/or owner. As I said, there will be a handful of times where he does this because of special circumstances, but it would likely be dictated by the teams' analytical departments and I doubt sending the pitcher to the plate will come up very often. The idea of sitting your DH because the other DH is better? That's going to play really well in the clubhouse. Or how well the pitchers hit? When do you think pitchers are going to practice hitting, now that all managers can use a DH? A hell of a lot less than they do now, and that ain't much. What you describe will last only a couple of seasons as pitchers hit less and less. If we're going to change, just make the DH universal and be done with it. I don't like it but it's inevitable. Let's just get it over with. So, to that way of thinking, you imagine a world where we could change a rule on a NASCAR racetrack for half the cars, and when one car wins that didn't have to observe the rule, the car that finishes first that did have to observe the rule would be inaccurate to claim that the race wasn't actually a legitimate race. My friend, you literally cannot have this both ways, as you propose. God help us that you don't work in a pharmaceutical lab. You're either testing and determining which PROCESS is more likely to yield a team capable of winning 4 games before a team under the other process, or you're testing which team was actually better, since both observed the exact same process. I know this gets uncomfortable for the folks who want to see things remain status quo. But I don't make the rules about experiments. And in the big picture, every season is an experiment to determine which team is best. I'm just going by scientific method, like anyone else who has had 9th grade science. Maybe you watch a different game... one where managers DON'T make batting changes and substitute one hitter for another on the basis of being just 10-20 points better... or even DON'T sub a lefty for a righty JUST to play the odds on the basis of handedness. In this world, managers pay attention to every little slight potential edge. If my DH and your likely DH are separated by 10 points difference in batting average, but your pitcher bats close to .100 and mine close to .200.... what fool manager can't do that math? What fool bench are you envisioning that can't do that math? Just my opinion, but I think most read what you wrote and would agree you're seriously stretching, and seriously closed-minded here. (02-11-2019 06:29 PM)Brookes Owl Wrote: If we're going to change, just make the DH universal and be done with it. I don't like it but it's inevitable. Let's just get it over with. Yeah. To hell with the 65%. Truth, even the 25% deserve to be able to watch the form of the game they enjoy, and not watch that form be damned by you and others like you to baseball history. You can't make an argument that justifies disrespecting either side of the customer base. You just can't. Both fully deserve to have their form of the game preserved for all time at this point. Not a huge follower of baseball but it would seem to make sense to let each team decide at the beginning of each season whether they will use a DH or not--a decision that's binding for the whole season. 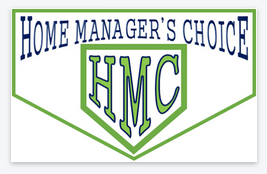 With the HMC, I would assume that it really wouldn't be the manager's choice in most cases. Analytics would say that hey, the BoSox have a top flight DH, and ours (because we can't afford to spend big bucks) is much worse. The pitcher to pitcher match up deciding would be less important, unless it was a good batting pitcher (Grienke, for example) vs a total zero. But is baseball (and the union) going to risk high priced players sitting much? What would be the deadline for announcing? Before the series? Day of game? Has to be some prep time for the visiting team. (02-11-2019 10:17 PM)dbackjon Wrote: With the HMC, I would assume that it really wouldn't be the manager's choice in most cases. When you decide to bat pitchers instead of a DH, you obviously have to take into account the strength of your overall bench (and thus potential PHs) versus the opposition. Sometimes you'd want to bat pitchers to compel the opposition to have to make a decision whether they want to play a lesser talent in the field in order to get the guy in the line-up, or a better talent in the field and just save the guy who would have DH'd for a later-inning substitution if you're behind. Again, it's only some of the time that the decision would practically make itself. There would be times when there's enough room in the analytics for a gut call. I mean, really, it just offers another interesting layer of "strategery." And for many of us, that's a fundamental reason we love football, because it is a sport saturated with strategy... your 11 moving parts versus our 11 moving parts. (02-11-2019 10:17 PM)dbackjon Wrote: But is baseball (and the union) going to risk high priced players sitting much? Last question first, I don't care. Me personally, I'm comfortable with doing it just like they do it in spring training... right before the game. I just don't see it as that much different than telling your young OF, "Hey, Bryce is a little gimpy today, and I just decided to give him the day off. You're in the line-up." There's only 25 players on the roster, and the only ones who are taken by surprise that they're not playing are the starting pitchers who aren't scheduled to pitch. But then, if someone wants to make the case for something else and has good reason, I'm open to it. Want them to have to dictate which games for the entire series before it starts? Okay. Want them to have to say one way or the other immediately after the preceding game? Okay. It's not a hill I care to defend that much. Then... a common false premise is that DHs of today are the fat, old deluxe sluggers of the earliest DH generation. They aren't, or at least, that's very rare. 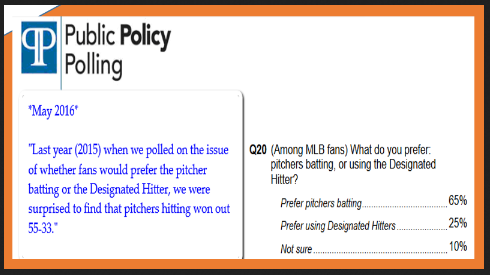 In fact, most DHs aren't so inept that they wouldn't be asked to play LF or 1B with some regularity as needed. "With David Ortiz gone, fewer primary designated hitters left in American League: There were 135 players who got DH starts for the 15 AL teams last season"
So, it's something that both the union and the NL owners can swallow without gagging. Lucky for you I'm a nuclear power plant safety inspector. Your analogy is poor, because it allows only for improvement in one half of the field, and no other effect. It might be more appropriate if you said "change a rule that makes half the cars go faster on straights but slower on curves, and half the cars vice versa", or something like that (I'm not a NASCAR expert). The point being, some cars get an advantage in some ways but also a disadvantage in other ways. And you all but agree with this in your post above when you point out that a manager might not choose to use a DH because of a given game's circumstances. Your (friendly?) insults aside, it's clear you agree with me. Fair enough - we'll have to agree to disagree. But it's not close-mindedness. My problem, which I freely admit, is that I'm a cynic. While the number of games where letting the pitcher hit might be large enough to be interesting (although still well in the minority), I think most managers will tend to take the safe route (i.e. use the DH). While I'm comfortable with the status quo (and so are you, apparently! ), I'd be fine with your proposal if we're going to change. I just don't think it'll amount to much different than if we just institute the DH universally. Kinda like 2 point conversions in the NFL, except with even fewer attempts. This gets back to my earlier point. I think you misunderstand the interests of the customer base. There are plenty of things about baseball that can be changed to make the customer base happier (and larger). The DH may not be in the top 10. For the record, I am for the universal DH so I'm not arguing the merit of the DH itself. (02-11-2019 06:56 PM)_sturt_ Wrote: Then... a common false premise is that DHs of today are the fat, old deluxe sluggers of the earliest DH generation. They aren't, or at least, that's very rare. As you said, there really isn't such a thing as a primary DH any longer. It's simply a position in the lineup rather than the definition of a type of player. Anyone can bat DH at any time essentially. The home manager, unless he's given a proposed lineup that's not allowed to be changed ahead of the game, will have no real idea who his opposing manager will select to play DH in a given situation. Therefore he cannot with certainty compare averages or any other stat. The only thing the home manager knows for certain is who he might choose to bat as DH in the lineup against the other team's starter. Now, he may very well have a good guess, but there's very little concrete information to go on because we're not talking about who you're going to play at Catcher...a position with very few realistic options. Given that lack of information, the manager has only 2 safe presumptions he can work with. 1. It's incredibly rare that a pitcher is more skilled at hitting than position players who are required to do it regularly. Given the reality that you must score runs to win the game, any manager will want his best hitters in the lineup if possible. 2. Keeping your pitcher from hitting will allow him more time and energy to focus on his most important skill set. This is true in training and preparation, but it is also true in game action. How often do we see pitchers disinterested at the plate? How often do we see pitchers push themselves on the base path? It is standard practice that a pitcher will save himself once in a batting role so as not to risk injury or exhaust himself unnecessarily. Technically, managers already have a choice in whether or not they use the DH. It's true they don't have the ability to make the choice on behalf of the other manager, but they nonetheless have an ability to refrain from using the DH should they choose. Why do they never do it? Because it is understood that a DH gives a team an advantage and no manager would ever risk batting his pitcher in a situation where the rules don't force him to. Back to my earlier point, you must score runs to win the game therefore offering your best lineup increases your chances of scoring and ultimately winning. To choose to bat the pitcher on the off chance the opposing pitcher was slightly more pathetic is not a good strategy for scoring runs. (02-12-2019 12:32 PM)Brookes Owl Wrote: Lucky for you I'm a nuclear power plant safety inspector. Your analogy is poor, because it allows only for improvement in one half of the field, and no other effect. It might be more appropriate if you said "change a rule that makes half the cars go faster on straights but slower on curves, and half the cars vice versa", or something like that (I'm not a NASCAR expert). To the contrary, my analogy DIDN'T specify improvement/advantage for one half of the field. You just read that part into it. It wasn't there. Re-read. I purposely ONLY said one half of the cars have a rule... which applies here... and the other half do not... which applies here. And yet, ***THAT ALONE*** is sufficient for EITHER type of car's racing team to BE ABLE to ***LEGITIMATELY*** observe that the RACE ITSELF didn't test for which car is faster, in reality, but rather WHICH PROCESS/RULE was more likely to produce a winner... the "winner," notably, according to the parameters that have been set as defining "winner," which may be 50 miles or 500 miles, may be a regular oval, or may be a road race, or otherwise. Again, I didn't invent scientific method. Argue with those who did. (02-12-2019 12:32 PM)Brookes Owl Wrote: The point being, some cars get an advantage in some ways but also a disadvantage in other ways. And you all but agree with this in your post above when you point out that a manager might not choose to use a DH because of a given game's circumstances. First, I make a conscious effort to stick with substance. Forgive me if I seem like I'm attacking/challenging/insulting you as a person. That's not my intent. My intent is only to attack/challenge/insult the counterpoints raised. And only because I genuinely have, no kidding, given a lot of time and thought and discussion over the course of 12 years to this topic. I'm satisfied that I'm right, not because I personally am some superior intellect that can talk down to people. I'm not. I have a terminal degree, yes, but I regularly tell people, I'm living proof that people of average intelligence can earn a terminal degree if they care enough and can focus. Rather, I'm satisfied that I'm right because I've participated in, literally, several hundred conversations by now, both online and in-person. It may end up coming across as condescending sometimes, but if you've ever spent 12 years focused on a particular issue, there comes a time where it's almost never that someone cites a line of rationale that you haven't already dealt with many times over, and you've long ago corrected yourself when you found that, indeed, someone exposed some flaw in your thinking that you hadn't figured out yet. So, if I'm understanding this part of your response... correct me if I'm missing it please... you're saying that because half of the cars have to abide by the rule and the other half do not have to abide by the rule, that then, BECAUSE THE EFFECTS of having or not having the rule can be interpreted as positive in some respects and negative in others for both sides... that in turn justifies/validates the difference in the rule. Correct? If so, let's go down that road together then. (If not, again, feel free to correct me.) Let's back up and set the parameters, okay? You realize, right(? ), that scientific method requires that, in order to receive valid results, we test the subjects (teams, in this case) that have, in every plausible way, been exposed to the exact same treatment (season of games, in this case) under the exact same conditions (rules, in this case). Exact same treatment... 162 games... not 162 for some, 150 for others. Exact same conditions... same rule book... not DH for some, pitchers bat for others. Now, let's think about your proposal, and hear me out as I try to explain why one's interpretation of the EFFECTS doesn't somehow justify the unequal treatment or unequal conditions, and as you allege, somehow in turn, re-validate the results. Here's one way to demonstrate that. Consider the fact that one can MAKE COGENT ARGUMENTS for why it is a positive for teams who only play 150 games AND ALSO negative... positive, they have 2 more opportunities a month to give their older players some better rest... negative, they get 2 fewer opportunities a month to give their younger players playing time. THAT, however, doesn't affect the fact that THE TREATMENT IS DIFFERENT, AND THE DIFFERENCE ON ITS OWN makes the experiment inferior in integrity to an experiment that has no such difference. If I'm lying, just pull out a 9th grade science textbook, quote it and expose me. I wasn't the one who came up with this stuff. I'm just repeating what we all were taught, and perhaps, taught repeatedly... and perhaps even, in turn, have taught others. I'm unfortunately short of time this evening, but I'll get to the rest soon enough. Thanks for engaging the conversation. I'm not being facetious. I appreciate it. Quote: Fair enough - we'll have to agree to disagree. But it's not close-mindedness. My problem, which I freely admit, is that I'm a cynic. While the number of games where letting the pitcher hit might be large enough to be interesting (although still well in the minority), I think most managers will tend to take the safe route (i.e. use the DH). While I'm comfortable with the status quo (and so are you, apparently! 03-razz), I'd be fine with your proposal if we're going to change. I just don't think it'll amount to much different than if we just institute the DH universally. Kinda like 2 point conversions in the NFL, except with even fewer attempts. Forgive me for doing this in pieces... but obviously, this is just a spare time thing we do, and my spare time is a little less available at the moment than it ordinarily might be. 1. In my discussions, it's fair to say a few people think like you do about it. And/but most do not, recognizing that managers, particularly of this new analytics generation, do not miss opportunities to get the upper-hand whenever and wherever possible. Going against objective math, and especially these days when stats are so widely available, isn't generally good for job security. Essentially... "Mr. Manfred, what do you and the owners have to lose? "HMC is at least a better alternative to rolling out DH ball as a top-down thing. It makes the decision organic, and delegates the decision to the people on the field, as opposed to the MLB aristocracy headquartered in New York. If the field generals make the decision to bat DHs 100% of the time, Joe Lunchbox Fan can better accept that than he can you suits making the edict from on-high." Yet you advocate for it to continue! If you want to be able to continue using the DH, frequently or infrequently, you are promoting a "solution" that perpetuates that perceived imbalance. It's really not that far from what I said previously: It's perfectly acceptable to have a championship that evaluates both the teams and the method of play, whether or not you can separate the contribution of each. Quote: Again, I didn't invent scientific method. Argue with those who did. I think you need to be careful using this term. I'd argue that a baseball (or any other sport) season is more trial and error method than scientific method. No one is putting forth and testing a specific hypothesis. At most, we ask the question "who is best" and then conduct a season of trial and error to see what happens. And, as I noted, I'm perfectly comfortable adding another question: What is the best approach - DH or not? Now, if you wanted to formulate a hypothesis, say, "Having a DH is better than not (or vice versa)," I'd say we've got the correct setup for that one! That aside, I'm not sure why you insist on scientific rigor here. The baseball season, as entertainment, doesn't have to be scientifically justified. Quote: You realize, right(? ), that scientific method requires that, in order to receive valid results, we test the subjects (teams, in this case) that have, in every plausible way, been exposed to the exact same treatment (season of games, in this case) under the exact same conditions (rules, in this case). It is absolutely necessary for good science. It's not really what the scientific method requires, but that is sort of neither here nor there because, again, we're really not applying the scientific method to a baseball season. And it's not science; it doesn't need to be. It's acceptable and not at all unprecedented to test more than just the best team. Quote: So, if I'm understanding this part of your response... correct me if I'm missing it please... you're saying that because half of the cars have to abide by the rule and the other half do not have to abide by the rule, that then, BECAUSE THE EFFECTS of having or not having the rule can be interpreted as positive in some respects and negative in others for both sides... that in turn justifies/validates the difference in the rule. Correct? No, I'm (still) saying your analogy is inapt. What you really have is a rule that helps some cars/teams sometimes, and other cars/teams at other times. To continue the auto racing analogy, in many forms of racing it is very difficult to tell what is more important: The vehicle or the driver. (Applies to horse racing as well.) Even in NASCAR, which has very similar vehicles and quite a bit of regulation, the setup of each vehicle can be somewhat different based on the teams'/drivers' choices. We don't make every racer drive an identically built and setup car, and we accept race results as credible. Quote: First, I make a conscious effort to stick with substance. Forgive me if I seem like I'm attacking/challenging/insulting you as a person. That's not my intent. My intent is only to attack/challenge/insult the counterpoints raised. Quote: God help us that you don't work in a pharmaceutical lab. So that was sincere?! Look, I appreciate your attempt to clarify here, and I don't believe you intend any malice. I am not offended or hurt (it's a sports message board for Pete's sake). But as point of clarification this IS condescending and unfortunately you're talking down from a pretty shaky ladder. You may be convinced you're right but you haven't done a very good job convincing anyone in this thread as far as I can tell. Your arguments are often contradictory and not well supported. It's an interesting subject and entertaining to debate. Maybe you have some data and/or analysis to support your points? If you've got more to offer I'd be happy to see it, but I think we've exhausted the talking points that are currently on the board. (02-11-2019 06:56 PM)_sturt_ Wrote: You can't make an argument that justifies disrespecting either side of the customer base. You just can't. Both fully deserve to have their form of the game preserved for all time at this point. Sorry. I think this might be one of the more closed-minded and disingenuous statements you've made here. (Again, that's my reaction to the statement itself, not an attack on you as-if that makes you a worthless human being or any such nonsense. We're just talking substance here.) Or, at the very least, seriously lacking in any support for the assertion, whether in the form of some factoid or in the form of some line of logical rationale. To the contrary, one cannot dismiss the fact that people have a favored form of the game. Now, to be fair, sure, for some percentage, it's merely a slight preference... but also to be fair, sure, for some percentage, it's not merely a slight preference, but one that genuinely is a factor in determining interest. I know first-hand people who stopped their lifelong support of the Houston Astros when their new owner and the commissioner conspired together to move them to the AL... DH ball is just too strategy-starved. I'm one of them, and I have friends and acqaintances who did the same. Am I saying that fans feel strongly enough about it that they'll quit if MLB HQ banishes their favored form of the game forever more? Actually, yes, some will. Some. They just have too many other entertainment options. And if people left baseball over labor strikes in the past, they will leave baseball over this kind of top-down decision as well. Will some continue to be fans, but who will lose interest? I'm sure that will happen. Will some not only continue to be fans, but become even more interested? No. That's not going to happen. People have Coke and Pepsi as-is right now, and just because you shut down the Coke plant and make them all drink Pepsi is not going to make Coke lovers suddenly more excited to have a Pepsi. And new customers? This just gives the finger to any logic. You shut down the Coke plant and everyone has to drink Pepsi... and that's going to lead to more people wanting to drink colas now? The ONLY logic they can introduce to that, as far as I have been able to imagine, is in the vein of pace of game. The traditional game is slower because you have more strategy involved, which inherently means more reasons to contemplate pitching changes. But the pace of play thing is ridiculously easily resolved. I'm very serious. Ridiculously easily resolved. But so as to not detour this thread, I'm not going there just yet. Circling back to the statement I made that there is no justification one can make for disrespecting the other side's preference... I stand by that. Whether it's a slight preference or a very strong preference, that actually makes no difference to the statement made... there's no justification for disrespect. The heart wants what the heart wants. Beauty... in this case, beauty of a sport... lies in the eye of the beholder. And no one should conspire to prevent people from enjoying what they enjoy... rather, we should do the opposite, though within the boundaries of what integrity expects (see previous discussion above concerning scientific method and NASCAR). EDIT: I see now that you've already responded to the previous post... again, sorry that this has to be in pieces for me... I didn't read whatever you wrote, but will get to it eventually.